This is an updated version that some of you might have read before. We were able to ‘live the dream of Italy’ full time because of my grandparents. On my grandfather’s birthday, I like to remind others of him and all the folks, who either by choice or not, immigrated to America and helped to make it into a strong country. If you are interested in more than my story I urge you to watch the series on PBS http://video.pbs.org/program/italian-americans/. While I don’t think that my grandparents had the same type of experience that happened in big American cities I think they had some of those experiences. Friday, March 1, 2019 is the anniversary of my grandfather (nonno), Antonio Iaccarino’s birth. He was born in mille otto cento settantotto or 1878 so he would be 141 years old. His parents were Ferdinando and Maria D’Esposito Iaccarino. Besides my grandfather, I know they also had 2 daughters, one, Concetta, (my Zia or aunt) who was 4 years younger than my nonno and another that I never met, Josephine who lived in Connecticut. In 2003 I began researching my grandparents’ lives so that I could apply to become an Italian citizen. In the process of this research I have learned some things which have brought me closer to my nonno who I never met. He died before I was born. I always think of him when I hear the Simon and Garfunkle song that starts “I left my home and my family when I was no more than a boy, in the company of strangers…” My nonno was only 12 when he joined the merchant marines (Marina Mercantile Italiana). Whether he joined willing or unwilling I don’t know. 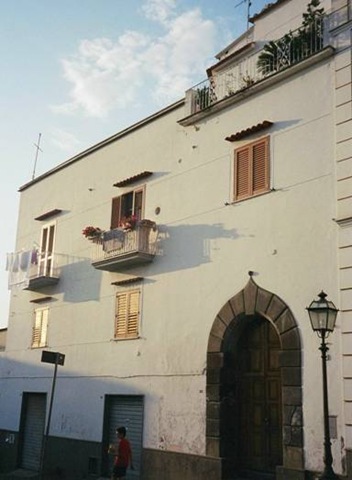 I do know that at that time he and his family were living in a room or rooms in this house in Meta, Italy. I have found this house because very dear friends, Tonino and Carmella Romano spent hours researching old town zoning records. It seems as if the town fathers in Meta like to rename and renumber streets all the time. Only the Romano’s tenacity helped me to find this place. So my nonno went to sea. He signed on as a mozzo (a cabin boy). Fortunately, his seaman’s book is still in our family. The entries are handwritten in script that I can’t always read and understand. (Someday perhaps…) So far, I know he was promoted, learned great skills that he would use later in life and four languages besides his native Italian. From the log I can tell that he returned to and left Italy a good bit. Stamps in his book show that some of the places he went to were Greece, Liverpool, England, Marseilles, France, and Odessa, on the Black Sea. Can you imagine sending off your 12 year old son and for the next 19 years only seeing him periodically? And he comes back with stories of places he has been to and things he has seen. 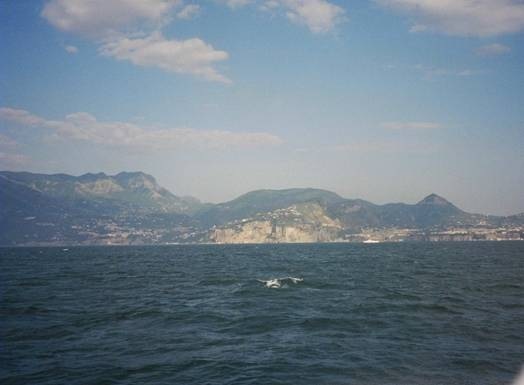 This is the view leaving the port of Naples that I am guessing is relatively unchanged even today. He did not always leave from Naples. Meta, the town south of Naples, where he lived was at the time a fairly large port and had a ship building facility. Today it is not. It is a small town with a nice sandy beach and a bedroom community for surrounding towns like Sorrento. 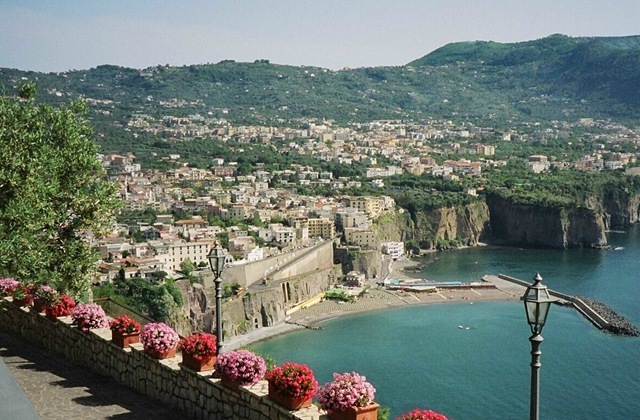 Even though Sorrento and Positano have been popular tourist destinations since the late 1800s prosperity did not arrive until after World War II. Before that, a large number of people of all age groups emigrated from the area to the United States and South America. But our family name, a very common one still remains in the area. From my nonno I think I have inherited my interest in other languages besides my native tongue. I do hold it against him that he did not allow Italian to be spoken in their house in America. My cousins have told me that he would scold my grandmother (nonna) if he caught her chatting with her friends in Italian (after they moved to America). He would say “We are Americans now, we will speak American”. (Italian men do so love to declare, dictate and proclaim, don’t they?) So my father never really spoke Italian. He never passed that on to me. I also know, that from my nonno, the spirit of travel and adventure passed directly to my father and then to me. My passport is never locked up in a safety deposit box. I like to have it near me so if the opportunity to travel arises I can just go. And I have a very cooperative and loving husband. After I finally got my Italian citizenship he didn’t mind when I packed us up and moved us to Italy. Recently, I was part of a conversation about ‘how many folks knew the name of a cousin of one of the their grandparents.’ On my mother’s side of the family I could say that I knew the name and I have a picture of the woman, sitting with my great grandmother (and her chickens!). On my father’s side, I don’t even know the names of all his brothers and sisters. And as his children die that information will be lost or much harder to find. The point that I took from this discussion was that in a very short period of time this knowledge of family is lost. Now I am climbing on my soapbox. The story of my grandparents’ migration is because of choices that they made, a story of a fairly easy journey with a very happy outcome. Everyday, in Europe, we see stories of families being forced to flee because of war. Their journey is not easy. Their greeting is not with open arms. Time will tell how their migrations will end. Time will tell how many of them will remember or know the name of their own cousin, much less the names of previous generations. I urge everyone of you reading this to examine your attitudes and thoughts about the current migrant crisis. Do some research and remember how America was built on the backs of immigrants. Immigrants who just might have been your relatives. Remember the ‘Golden Rule’ that many of us learned as a child. Wonder that if your ancestor had not have made a migration you might be not be enjoying the freedoms and comforts that you have now. I’m off my soapbox now. Little by little, with research, the help of friends and the memories of my family I learn about my grandparents. On Friday or when ever you think about it, please raise a glass of wine or a mug of coffee to my nonno and nonna who had the spirit and sense of adventure to try something different and create a new life for themselves. Most Americans have ancestors that emigrated. I have been lucky enough to be able to trace mine and fill in some of the blanks. If you have any interest in your own background you should try it. You learn about the past and look what it led to for us. Buon Compleanno Nonno! And thank you from all of my heart! The Grandparents in the late 1940s. Thursday, March 1, 2018 is the anniversary of my grandfather (nonno), Antonio Iaccarino’s birth. He was born in mille otto cento settantotto or 1878 so he would be 140 years old. His parents were Ferdinando and Maria D’Esposito Iaccarino. Besides my grandfather, I know they also had 2 daughters, one, Concetta, (my Zia or aunt) who was 4 years younger than my nonno and another that I never met, Josephine who lived in Connecticut. I’m off my soapbox now. Little by little, with research, the help of friends and the memories of my family I learn about my grandparents. On Thursday or when ever you think about it, please raise a glass of wine or a mug of coffee to my nonno and nonna who had the spirit and sense of adventure to try something different and create a new life for themselves. Most Americans have ancestors that emigrated. I have been lucky enough to be able to trace mine and fill in some of the blanks. If you have any interest in your own background you should try it. You learn about the past and look what it led to for us. Look what I forgot to do this year. Honor my Grandparents. The folks who made our lives in Italy possible. I feel badly that this has happened. I think it is because I feel so far removed from our life in Italy. Most of my time is consumed with caring for the two of us and the very minor role of making decisions about our condo being remodeled. (Basketball might have consumed some time too) Perhaps when we are in our own place, with all our things out and about I will think more often about living there. Anyway, here is the story. Wednesday, March 1, 2017 is the anniversary of my grandfather (nonno), Antonio Iaccarino’s birth. He was born in mille otto cento settantotto or 1878 so he would be 139 years old. His parents were Ferdinando and Maria D’Esposito Iaccarino. Besides my grandfather, I know they also had 2 daughters, one, Concetta, (my Zia or aunt) who was 4 years younger than my nonno and another that I never met, Josephine who lived in Connecticut. Now I am climbing on my soapbox. The story of my grandparents’ migration is because of choices that they made, a story of a fairly easy journey with a very happy outcome. Everyday, here in Europe, we see stories of families being forced to flee because of war. Their journey is not easy. Their greeting is not with open arms. Time will tell how their migrations will end. Time will tell how many of them will remember or know the name of their own cousin, much less the names of previous generations. I urge everyone of you reading this to examine your attitudes and thoughts about the current migrant crisis. Do some research and remember how America was built on the backs of immigrants. Immigrants who just might have been your relatives. Remember the ‘Golden Rule’ that many of us learned as a child. Wonder that if your ancestor had not have made a migration you might be not be enjoying the freedoms and comforts that you have now. I’m off my soapbox now. Little by little, with research, the help of friends and the memories of my family I learn about my grandparents. On Wednesday or when ever you think about it, please raise a glass of wine or a mug of coffee to my nonno and nonna who had the spirit and sense of adventure to try something different and create a new life for themselves. Most Americans have ancestors that emigrated. I have been lucky enough to be able to trace mine and fill in some of the blanks. If you have any interest in your own background you should try it. You learn about the past and look what it led to for us.